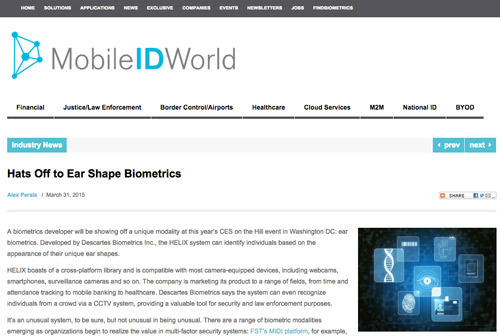 A biometrics developer will be showing off a unique modality at this year’s CES on the Hill event in Washington DC: ear biometrics. Developed by Descartes Biometrics Inc., the HELIX system can identify individuals based on the appearance of their unique ear shapes. HELIX boasts of a cross-platform library and is compatible with most camera-equipped devices, including webcams, smartphones, surveillance cameras and so on. The company is marketing its product to a range of fields, from time and attendance tracking to mobile banking to healthcare. Descartes Biometrics says the system can even recognize individuals from a crowd via a CCTV system, providing a valuable tool for security and law enforcement purposes.